The perfect coastal escape from the hustle and bustle of the tourist mecca that is Sydney, Jervis Bay is one of the top getaways in the region. With immense natural beauty, both on shore and off, the marine park is the main drawcard for visitors. The vibrant blue waters and soft sand all contribute to the popularity of the beaches in the region. Another highlight of the area is its prime position for whale watching during the migrating season, mix this incredible animal encounter with the beauty of the Jervis Bay Marine Park and surrounding Booderee National Park and you have a breathtaking holiday that you needn’t travel far to enjoy. Jervis Bay’s Booderee National Park is filled with outstanding natural beauty and is home to around 200 different bird species and 30 native mammal species. This national park is a significant place for the Wreck Bay Aboriginal Community and Koori people; Booderee is an Aboriginal word meaning ‘bay of plenty’ and visitors to the area are asked to take care and respect the grounds. There is a free smartphone app for visitors to download to help them navigate the national park and learn all of the interesting facts and stories about it. There is a range of activities in Booderee National Park including taking part in Booderee’s Aboriginal interpretive program to learn about Koori culture and their traditional foods, follow one of the multiple walking trails, catch a wave at Cave Beach or swim with schools of fish at Green Patch Beach. Cape St George Lighthouse is also a popular destination for whale watching during migration season. Embark on the ultimate whale-watching journey in Jervis Bay – a popular hotspot for migrating humpback whales. Aboard a luxurious vessel, you’ll be able to get a glimpse of these amazing creatures as they play and frolic in the water in close proximity to the boat. The sheltered waters of the area are an ideal location for the migrating whales from September to November. Aboard a luxurious vessel you’ll be able to get a glimpse of these amazing creatures as they play and frolic in the water in close proximity to the boat. The best way to catch a glimpse of these creatures and their curious calves is aboard an organised tour – the experienced guides know where to go for the best views and can tell you all there is to know about these creatures that frequent the area. If you book a tour with Jervis Bay’s Eco Adventure Tours, you will get a seat aboard one of their modern, purpose-built boats – one vessel has a submersible camera and another has awesome underwater viewing windows. A significant European site located in Booderee National Park, the Cape St. George Lighthouse ruins hold a fascinating, grim history. With many unfortunate and accidental deaths taking place at the site, the stories (dating back to 1867) have come to be known to visits over the years. The ruins have been listed on the National Estate Register since 1981 for its important setting, stonework and as a relic of early European occupation. The site is now a popular viewing platform for whale watching during the migrating season towards the end of the year. The Cape St. George Lighthouse is a must-see for visitors to the Jervis Bay region for both its rich history and spectacular views. Moona Moona Creek is the perfect place to set up camp for a few days and relax on the soft sand overlooking the clear blue water. An ideal spot for the whole family, the younger kids will love splashing around in the safe, shallow waters around the shore. You could spend hours just lazing on the beach or wading in the waters – it will most likely be a feat getting the troop back in the car to leave. Low tide uncovers large sand dunes, which are great platforms to explore the area. If you’re visiting at high tide you won’t be disappointed, kayaking is a popular past time in the creek as well as swimming so prepare yourself for a day in or on the water. The area is surrounded by great facilities for the public to use, including a playground for the kids, toilets and change rooms. Showcasing a wide range of world-renowned maritime collections and artefacts, Jervis Bay Maritime Museum is a must-see. 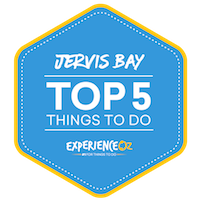 The museum displays a range of nautical equipment, models, photographs, paintings, drawings and more explaining the history and heritage of Jervis Bay. Located on the waterfront of Currambene Creek, the museum houses a selection of historic vessels including the Lady Denman ferry. The museum provides visitors with information about the rich history of the area including its Indigenous culture and its strong maritime history. There is a range of exhibitions showcased throughout the year as well as monthly markets held on the grounds featuring locally made produce and hand-made products. Exhibitions are changed frequently allowing you to visit multiple times and learn something new every time.